I love cookies, but my love is tempered by a small personal problem – despite my life long vegetarianism, daily exercise, and general dislike of eggs and dairy I have above normal cholesterol levels. Now, before you send me a condolence letter I should let you know that it is not technically in a high range, but it was high enough to catch my attention when I was ready to blow my last check-up out of the water. Some additional family research revealed some more disturbing facts, like that everyone in my family over the age of 50 has been diagnosed with heart disease and I am probably one of the 30% of people who are susceptible to dietary cholesterol. So, I love cookies but it is important to me to avoid dietary cholesterol as much as reasonably possible. One solution is to make vegan cookies, but it would be erroneous to assume that all vegan foods are necessarily better for you than foods that may contain dairy or egg products. This is because many of the easiest to find vegan substitutes (margarine) contain trans-fats which – even though they contain no cholesterol – act to raise bad cholesterol in the blood. To me, part of making a good cookie means making one that I can enjoy knowing that I am not consuming cholesterol or trans-fats, and it also has to taste great. 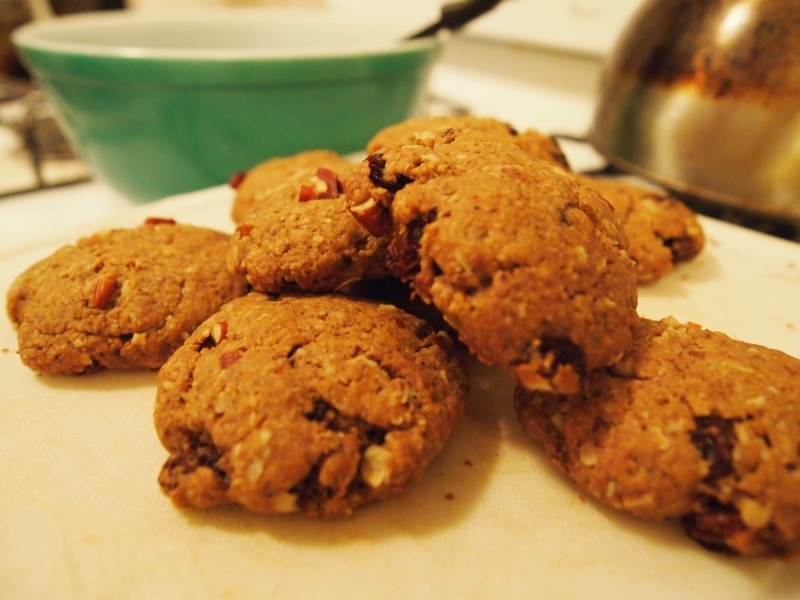 To this end I created this vegan oatmeal raisin cookie recipe. They are nutty and spicy with a texture that is indistinguishable from a good conventional soft oatmeal cookie. It also has the added benefits of omega-3s from ground flax seed. So, while it is not quite health food, these treats aren’t detrimental to your cardiovascular health and might even contain the glimmer of a benefit.